Focus is one of Germany’s most established bicycle brands. Whether you follow MTB sport, the international racing scene or cyclocross, you will meet top athletes and ambitious hobby athletes alike on Focus bikes. With good reason, because these performance-oriented bikes often carry their riders onto the podium. Is it their German engineering? Find out for yourself. In every model, from entry-level rides to team bikes, the company’s passion for cycling is obvious. Focus manufactures performance-orientated bikes that push the boundaries of technology and development to give riders the ultimate cycling experience. The versatility of Focus bikes makes it a popular brand with cycling enthusiasts of all levels. In every model, from entry-level rides through to professional team bikes, the company’s passion for cycling shines through every nut and bolt. Focus is known for anticipating the needs of cycling enthusiasts of all levels, offering road bikes, cyclocross bikes, hybrid bikes and mountain bikes of superb quality. So whether you want to challenge yourself to a long endurance ride or simply hop on your bike for a tour with friends, the Focus product range can help you to decide which is the best bike for you. With a Focus bike, you can expect durability and quality as well as the latest technological advances. The Focus brand not only produces bikes, but it also designs a comprehensive range of clothing accessories to enhance your cycling experience. Focus has its headquarters in Coppenburg, Germany. Founded in 1991 by three-time cyclocross World Champion Mike Kluge, the firm partnered with the manufacturer Derby Cycle to produce a range of bicycles, initially focused on mountain bikes, but touring bikes and road bikes were soon to follow. The first-hand experience of its founder is fundamental to the company’s ethos and development: a determination to make performance-based bikes that are built to meet the requirements of their customers. Focus has become a benchmark in its sector thanks to the committed research and development of new technologies and a dedication to creating both the best possible bikes and the best possible cycling experience for its riders. Focus offers durability, quality and a long guarantee on its products. 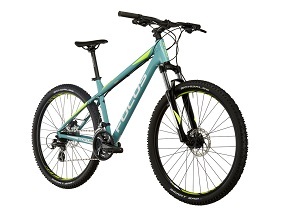 Bikester.co.uk stocks an extensive range of Focus bikes, including hardtail and full suspension mountain bikes, road bikes, hybrid bikes, cyclocross bikes and e-bikes. Renowned for their advanced technologies and standout components, including the use of lightweight carbon fibre forks that offer excellent resistance, both the frames and the steering tubes are developed with long-distance comfort in mind and the bikes are designed to adapt to any terrain, including muddy, uneven or asphalt. Frames are usually made from aluminium, thanks to its durable, long service life and flexible, lightweight properties. Focus also designs a range of electric bicycles, which are designed to optimise rider experience while dramatically increasing the rider’s radius and riding fun. Bikester.co.uk also stocks Focus clothing accessories including socks, t-shirts, cycling shorts and light jackets.